John Tregerthen Short (JTS) made a very brief entry in his diary for 15th October 1824. He wrote simply, Arrived a steam vessel, which went for Hayle. This may well have been the first steam vessel sighted from St Ives. It's certainly the first one mentioned in by JTS. An editorial comment in the published diary records a story that the appearance of the ship caused great excitement as it was considered to be a ship ablaze. Boats were manned to make a rescue attempt but as the vessel came closer she was revealed to be a steamer. The question is, what vessel was she? JTS does not give her name and the Royal Cornwall Gazette (RCG) does not include ship movements for Hayle or St Ives for the appropriate period. However, 1824 is quite early in the history of steam vessels, there are still very few to choose from and, as it happens, one in particular paddles her way out of history into just the right place at pretty much the right time. In his 2009 article on Cornish Steam Ships and Owners, Roy Fenton mentions a vessel called Cambria which was working the Plymouth to Falmouth route in the summer of 1824. A bit of digging in the RCG turned up a record of her arriving in Falmouth from Plymouth on 23rd May 1824. The next day she left to return to Plymouth. There's no doubt that this is the right ship as she is described as a steamer. Her skipper is Captain Parfitt. 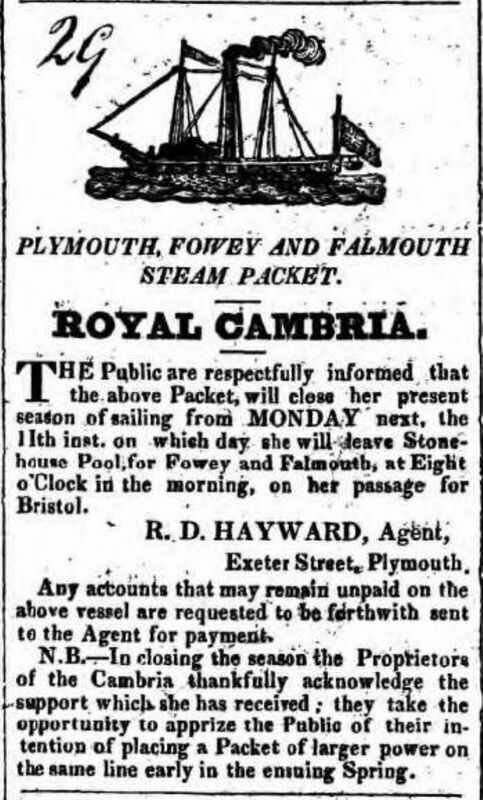 The RCG of 22nd May 1824 contains an advertisement for the Devon and Cornwall All Steam Packet CAMBRIA which is to sail from Falmouth to Plymouth on Monday 24th May at 8am, stopping at Fowey for one hour. The ad. goes on to say that Cambria has enjoyed a successful season making a daily return trip between Bristol and Newport. These are the first records of her in the RCG but for the rest of the summer she moves back and forth between Plymouth and Falmouth, sometimes named as the Royal Cambria and usually just Cambria and always skippered by Captain Parfitt..
Cambria continued to ply between Plymouth and Falmouth, usually with a stop at Fowey, until October. On 13th October she arrived in Fowey from Plymouth and was then recorded as sailing for Bristol. This is her last entry in the RCG, there are no records of her at Penzance, St Ives, Hayle, or Padstow, which she may have called at on her way to Bristol. However the Bristol Mirror of 23rd October 1824 records the Royal Cambria, steamer, Parfitt, arriving at Bristol from Plymouth. Why does she disappear between Fowey and Bristol? Difficult to say, perhaps because she was carrying neither passengers nor cargo and therefore not of commercial interest? The Bristol Mirror does not say on what day she arrived in Bristol so all we know is that it was sometime between 17th and 22nd October. JTS does not mention the departure of the steamer from Hayle and there are no mentions of her in Lloyds List but her movement would allow for her to have arrived at Hayle on 15th October, probably to replenish her coal stocks. So, it seems likely that the steamer seen by JTS on 15th October 1824 was the Cambria, on her way back to Bristol where her owners were based. However, she must have passed that way before, in spring 1824 when on her way from Bristol to Plymouth so why was she not seen? Maybe visibility was bad, maybe she was well out at sea but it certainly it wasn't because JTS was too busy writing about other things, his diary for March and April 1824 contains only five entries. The commencement of the steam-packet service from Plymouth to Falmouth was advertised in the Royal Cornwall Gazette of 29th May 1824. The final run of 1824 was advertised in the Royal Cornwall Gazette of 9th October 1824.